The Manchester suicide bomber was repeatedly flagged to the authorities over his extremist views, but was not stopped, it emerged last night. Counter-terrorism agencies were facing questions after it emerged Salman Abedi told friends that "being a suicide bomber was OK", prompting them to call the Government's anti-terrorism hotline. Sources suggest that authorities were informed of the danger posed by Abedi on at least five separate occasions in the five years prior to the attack on Monday night. The authorities were also aware that Abedi's father was linked to a well-known militant Islamist group in Libya, which is proscribed in Britain. Abedi also had links to several British-based jihadists with Isil connections. Yesterday his father was detained by Libyan militia in the capital Tripoli and the suicide bomber's two brothers have separately been arrested on suspicion of terrorism offences. The missed chances emerged on a day of heightened police activity as the hunt for Abedi's terror cell intensified.Officers raided the suspected "bomb factory" where it is feared he made the device before the attack and later arrested a white woman at a block of flats six miles away. Officers raided the suspected "bomb factory" where it is feared he made the device before the attack and later arrested a white woman at a block of flats six miles away. Last night, British Home Secretary Amber Rudd conceded Abedi was known to the intelligence services, with officials braced for criticism over the apparent failures. * It emerged that security services were examining links between Abedi and an expert bomb-maker who had lived in the same street in Manchester. * Leaked pictures last night emerged in the United States of fragments of the bomb, prompting a diplomatic row between Downing Street and the American security services. Britain was placed on security lockdown with soldiers on the streets and several high-profile events cancelled, as well as events this weekend - including the FA Cup final - having their security reviewed. * The British election campaign will resume with Ukip launching its manifesto today. * A female police officer was revealed as one of the bomb victims, as further identities were confirmed. The missed opportunities to catch Abedi were beginning to mount up last night. One community leader said that Abedi was reported two years ago "because he thought he was involved in extremism and terrorism". Mohammed Shafiq, chief executive of the Ramadhan Foundation, said: "People in the community expressed concerns about the way this man was behaving and reported it in the right way using the right channels. They did not hear anything since." Two friends of Abedi also became so worried they separately telephoned the police counter-terrorism hotline five years ago and again last year. Akram Ramadan (49), part of the close-knit Libyan community in south Manchester, said Abedi had been banned from Didsbury mosque after he had confronted the Imam who was delivering an anti-extremist sermon. Mr Ramadan said he understood that Abedi had been placed on a "watch list" because the mosque reported him to the authorities for his extremist views. A well-placed source at Didsbury mosque confirmed it hadw contacted the Home Office's Prevent anti-radicalisation programme as a result. A US official also briefed that members of Abedi's own family had contacted British police saying that he was "dangerous", but again the information does not appear to have been acted upon. Abedi's own family background might also have been a red flag to authorities. His father was a member of the militant Libyan Islamic Fighting Group. Yet Abedi was able to travel frequently between the UK and Libya, where it is feared he trained in bombmaking and possibly travelled to Syria. His youngest brother, Hisham - who is photographed on social media wielding an automatic rifle, was yesterday arrested by the Libyans who suspect him of knowing about the Manchester plot in advance and plotting his own attack in Tripoli. US authorities said Abedi was known to them prior to the atrocity while France's interior minister said the 22-year-old had "proven" links with Isil and that both the British and French intelligence services had information that the attacker had been in Syria. Ramadan Abedi, the suicide bomber's father, who now lives in Tripoli, gave a series of interviews to the media yesterday in which he denied his son was to blame. But a friend of the family said Abedi's parents had become so concerned about his behaviour they had ordered him to leave the UK and live with them in Libya. Adel Elghrani said: "The father was so concerned he confiscated his passport. But then Salman went to his mother and said that he wanted to go on a pilgrimage to Saudi Arabia and she gave him his passport back and he came to England instead." 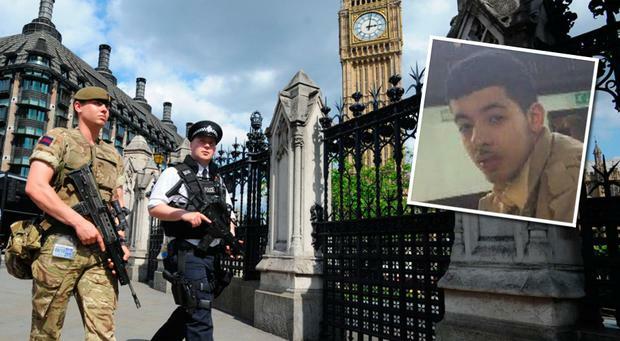 Abedi flew back to Britain and carried out his deadly attack a few weeks later. 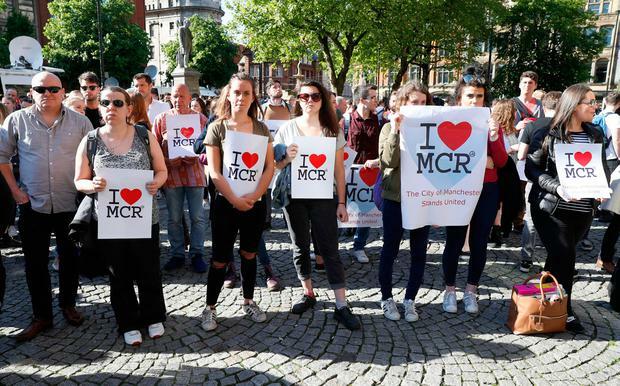 Counter-terrorism officers now believe that Abedi rented a flat through Airbnb in the days before the attack and stayed there until around 7pm on the night of the Ariana Grande concert at the Manchester Arena. He carried the bomb to the music venue's foyer in a rucksack and detonated it at just after 10.30pm as the American pop star was completing her last song. Sources last night said that there were two separate bomb factories, with the chemicals mixed in the rented Airbnb flat in Granby Row before the bomb itself was assembled elsewhere. It was not clear if the second flat had been discovered. The photographs of the bomb fragments were leaked to the 'New York Times' hours after Ms Rudd had said leaks of intelligence shared with the US authorities had to stop. It prompted an outcry in Whitehall, with Ms Rudd and Jeremy Wright, the Attorney General, understood to be among officials who phoned their American counterparts to demand answers.